The dishwasher is a modern convenience that saves us hours of cleaning and drying time, not to mention pruny dishpan hands. But is the dishwasher an extravagance in our eco-conscious age? You might be surprised! The answer is no – and that’s a win-win for those who believe that technology can lead to a greener, more prosperous future. Researchers at the University of Bonn recently asked, “Is a machine more efficient than the hand?” by analyzing the habits of over 100 dishwashers across Europe. The study uncovered interesting profiles of various dishwashing styles across European countries – Spain used the most water and energy, while Italy scored highest on the “cleaning index.” But even accounting for regional variations, dishwashing by hand used more energy and water (on average 27 gallons and 2.5 kWh) than a dishwashing machine (4 gallons and 1-2 kWh). But this study was conducted in Europe, home of the super efficient dishwasher. 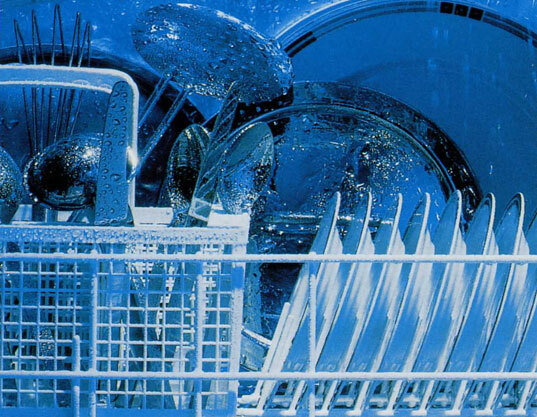 The American dishwasher is a different animal – louder, bigger, and more plastic. The European dishwasher is smaller in stature, less obvious, control panel hidden from view, often silent, an object of desire. So how do those Europeans have an edge on us? 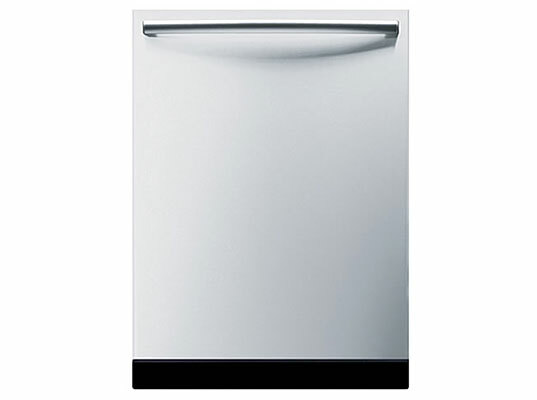 Certain dishwasher models from Europe are designed to get the dishes clean at maximum temperatures. Stainless steel interiors, rather than plastic, are used to retain more heat. The condensation cycle is used to keep the contents warm, and ultimately dry. European dishwashers are more eco-friendly, using 4 gallons of water verses 14 gallons in American models, and less energy to run the machines. This is driven by better design, but also much higher standards from the European Union. The EPA’s Energy Star program is voluntary, whereas in Europe eco-efficiency is mandatory. There are no wasteful appliance options in Europe. Eco-efficiency is not the only standard for European dishwashers – the EU also demands that appliance makers publish information about noise pollution as well. Europe has standardized decibel measurements, and there has been talk of Sears adopting a similar approach . Less water, less energy, more heat, platinum interior finishes. Is the European dishwasher a model for how green design is great design? 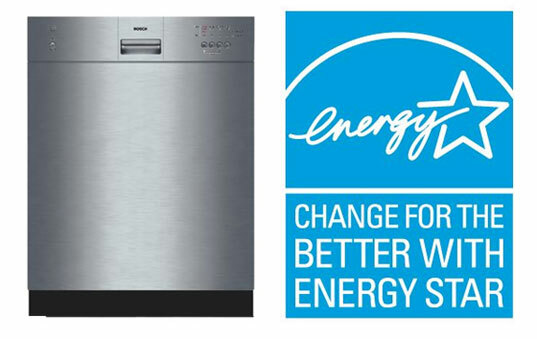 A full energy-efficient dishwasher cleans best and has the lowest environmental impact of any other method. Discard whatever food waste you have into your tidy compost bin, and place your dishes and cutlery straight into the dishwasher – you’ll be saving water and time. Delay the start of your dishwasher for off-peak utility hours, which may even offer reduce rates based on your energy provider. Avoid phosphorous-laden detergents or other harmful chemicals. For the greenest machines available in the US today, the EPA’s Energy Star guide is the best resource. Next week in our Green Your Appliances series: KITCHEN GADGETS! Jennifer is a leader in brand and product innovation, and is a founding principal at research design house Risqué Consulting. A former Wall Street analyst and economist, Jennifer transitioned into the design industry upon graduating with an MBA from HEC in Paris. 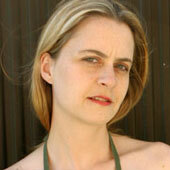 She has held strategy and executive management positions at Organic, Inc., Frog Design, and Fahrenheit 212. A leader in the green design community in NY, Jennifer serves as chapter chair of o2-NYC, and lectures on the topic of sustainable innovation. When I fill a dishwasher, it takes about two days worth of dishes or so. This saves doing a hand-wash twice a day etc. so the figures quoted are accumulative for water used, ie. 4 basins full compared to one dishwasher cycle. The dishwasher might use less WATER than hand washing if someone uses copious amounts of water (I don't). The study which is usually cited was not peer-reviewed and assumed people used a lot of water. Regardless, this doesn’t factor in the energy and water used in mining the metals, getting the metals to the factory, pollution caused by the factory (differs across countries), energy used in manufacturing the parts of the dishwasher, pollution and energy involved in manufacturing plastic and vinyl aspects of the dishwasher, and energy involved in shipping the dishwasher to the show room, your house, running the dishwasher, and sending the dishwasher to the dump (and the environmental cost of the parts which won’t degrade for 10s of thousands of years). The suspicious are correct! The research did not prove the efficiency of dishwashers, it proved the inefficiency of some people. I read the report and it said that the worst offenders would leave the hot tap running freely in a second sink to rinse! The test was also not a 'real' simulation. It used a European testing standard that all dishwasher manufacturers use to benchmark their products. This standard specifies a certain number of items, with a certain level of soiling. It is a very tough test. The point being, a dishwasher will not get it all off, but the tester can see how close they got. Therefore, the humans in the test, would have tried extra hard to clean the plates, using more water/energy, while the dishwashers simply run through their program regardless. I try to run my dishwasher when I am around so that I can stop it once it gets to the dry cycle. Using that extra heat is a complete waste of energy (not to mention how it just adds to the already unbearable summer heat! ), and dishes can dry just fine on their own at room temperature. I highly recommend this, and I read somewhere that it cuts dishwasher energy consumption in half -- not so sure about that, but it obviously cuts some of it. I'm not sure how the calculations are done, or whether they are sponsored by a dishwasher manufacturer: The dishwasher is only efficient with full loads. But most people won't use it that way, they will wash as and when there are dirty dishes. So wouldn't it be more wasteful in the real world? How could anyone use 27 gallons to wash thier dishes by hand, that is more than 100 litres, that is more water than will fit in both my sinks, I think this number is ridiculous. I have a relatively new frigidaire dishwasher but wash all my dishes by hand with less than 20 litres of water and only when I have generated a sinkful of dishes and I air dry... how can any dishwasher compare with that??? I have a Danby countertop dishwasher. It only cost me $160 on Amazon. It plugs into the tap on my sink, and then empties the dirty water into it as well. It leaks on occasion, and you have to clean the filter regularly. And admittedly, doesn't get the dishes as clean as with the larger varietals, but hey, it fits in my little NYC apt. quite nicely. dishwasher drawers: http://www.fisherpaykel.com/dishwashing/ expensive, about $1500 (per drawer) but very nice-of course-know someone with two--one on either side fo sink--loves it--can do 1 load or use both when entertaining--fill one while other runs. in sink: kitchenaid http://www.kitchenaid.com/catalog/product.jsp?src=briva++in-sink+dishwasher&cat=967&prod=625 even more expensive, $1879, but it is also a sink... no mention of Energy Star on either site page. Could you also provide a link to North American (Canada) distributors of European dishwashers. I've seen a sink/dishwasher that can serve as both so It doesn't take up any room and it's supposed to be super quiet. 14 gallons of water used in an American model versus 4 gallons here in Europe? Why? Come on American manufacturers/designers/consumers, there is absolutely no reason for that. I had no idea that European dishwashers were so much different - I'm shocked and appalled that companies would knowingly waste so much water when there has clearly been a solution. If that alone is such a massive difference, what on earth are they wasting with their washing machines, showers, swimming pools!? The dishwasher is a modern convenience that saves us hours of cleaning and drying time, not to mention pruny dishpan hands. But is the dishwasher an extravagance in our eco-conscious age? You might be surprised! The answer is no - and that's a win-win for those who believe that technology can lead to a greener, more prosperous future.